1. Toss the vegetables in the oil and season well. Griddle for 6-8 minutes or until tender and slightly charred, you may need to do this in two batches. 2. Meanwhile, mix the yogurt and harissa together. Bake the falafels in the oven according to pack instructions. 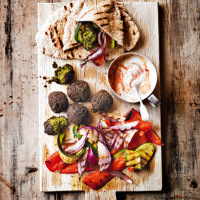 Split the pittas and fill with the vegetables and falafels, spoon over the yogurt and serve.